The book under review may appear as an ambitious project. What the authors attempt to address here is the complex puzzle of Indian democracy through their multi-modal enquiries into questions of gender and representation. True to their ambitions, these worthwhile attempts have led to a distinct contribution to the contemporary debates on gender and politics in India and elsewhere. The role of women in Indian politics has been much celebrated over the past few years. Initially it was about the empowerment of women through reservations guaranteed to them in the local self-government institutions. Then the celebratory discourse moved to the (still pending) women’s reservation bill that had promised similar reservations to women in higher level political offices. More recently, the potential empowerment of women voters through their increasing turnout in State level elections is applauded in the media. Unfortunately, though these discussions granted a lot of visibility to women and their politics, they did not contribute much towards a politically sensitive gender discourse and/ or a gender sensitive political discourse in the true sense of the term. Rather than symbolic, token celebrations of women’s participation in politics, theorizations in the field of gender and representation require critical engagements with routine participation of women in politics, both as elected representatives and as electors. At the same time, a politically sensitive gender discourse would also need to critically engage with the overall nature of democratic politics and its complexities. In other words, in order to understand women’s politics, we need to understand how women operate when they are exposed to the roughhouse of politics and we also need to develop a deep understanding of the political roughhouse itself. The book is a rare attempt by Rai and Spary to undertake this twin task where they enquire into the issues of gender and representation in Indian democracy to question and problematize the very notion of democratic representation. They use two strategies for this exercise. The first is to develop what they call a ‘politics and performance’ framework to evaluate the individual and institutional claims of representation in Indian democracy. Secondly, very appropriately, the authors use a multi-method approach in their research that brings together the insights of quantitative and qualitative research. Both strategies contribute to the uniqueness of the book under review. 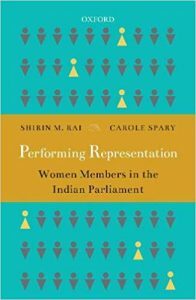 In its empirical research the book examines the role of women in the Indian Parliament. In order to make it a comprehensive enquiry the book begins with a historical account of women in Parliament. The subsequent chapters undertake detailed enquiries into the various avenues of parliamentary access to women’s candidacy in the Lok Sabha elections and social profile of women MPs in order to decode the intersectionality of identities and also to explore the linkages between the parties, movements and women representatives. In the second part, the work focuses on performance of women members of Parliament in terms of their presence and participation in debates, the working of the parliamentary committee for the empowerment of women as an only female dominated committee in terms of its membership and the effects of money on garnering resources for influence. The chapter on narratives of politics and leadership discusses whether/how women’s precarious position within Parliament, within parties and in the public and the private realm generate a vocabulary of service rather than leadership as an appropriate characterization of women’s work. Finally, the book also addresses the issue of sustainability of women’s participation in politics in its detailed enquiries with women MPs. This is a very important but usually neglected aspect of debates on women’s political participation. The debates on women’s quota in particular, largely focus on women’s entry in politics. However, the real issue is their survival after the initial recruitment. The book documents rich and layered narratives of negotiations that women representatives have to conduct in order to survive and be successful in politics. In all these chapters, the book brings together quantitative and qualitative, aggregate and newly generated, historical and contemporary data to piece together an immensely interesting and equally complicated story of the Indian Parliament as a gendered site of representation. There are two sets of conclusions that the book develops in its research of women in the Indian Parliament. The first set of conclusions reflects on how gendered marginalization continues in the Indian Parliament and how it acquires a complex form in terms patterns of leadership––where they become gendered social construction rather than individual attributes, in terms of gendered patterns of corruption and in terms of gendered access to Parliament both at the social and institutional level. At yet another level, the book also analyses the Parliament as an important work site of Indian democracy. This analysis uses a combination of feminist, political economy and performance approach. The use of politics as performance framework allows the authors to highlight the hitherto untapped factors that may contribute in making the parliament gender sensitive. The authors argue that although punitive actions may be necessary against the gender abusive behaviour in Parliament, it is informal, and behavioural reforms that would really make Parliament and other political institutions more gender sensitive. In their use of the performance framework the authors also establish how institutions like Parliament that are often presented as undifferentiated are historically marked with deep social divisions and how these inequalities are engraved in the very relationship that such institutions forge with the citizens of the country. At both these levels, the book underlines the theoretical and political nuances surrounding the issues of gender and representation and of democratic representation in a contextual democracy. It also underlines the need to study routine patterns of political participation of women in order to shape a politically sensitive gender discourse in theory and practice. We need more such studies. And we also need these studies to expand their scope of enquiry to the real roughhouses of Indian politics as they operate at the State and the district level. Although Parliament is an immensely important decision making institution of Indian democracy only a few women operate there. Women’s routine political participation instead happens at the sub- national level. Empirical theorizations of gender representation need to take their enquiries to these sub-national political roughhouses. Rajeshwari Deshpande is Professor in the Department of Politics and Public Administration, Savitribai Phule Pune University, Pune.